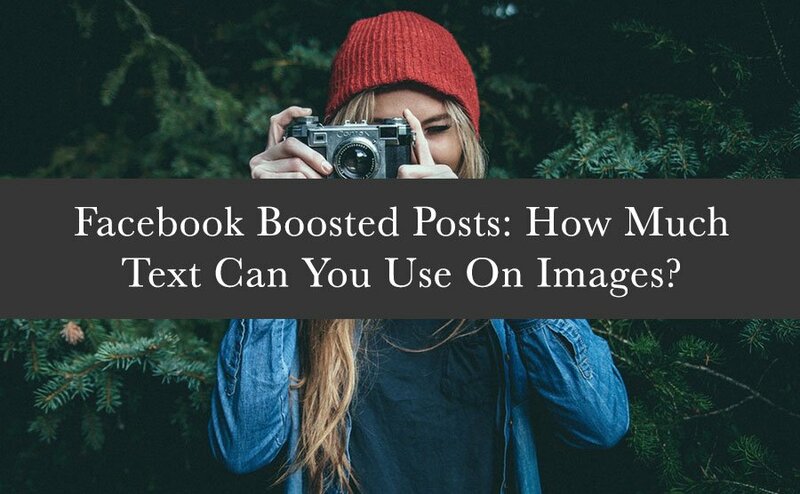 In mid-2016 Facebook made changes to its advertising policy that applied to text on images for boosted posts as well as to the more typical Facebook ads. Prior to mid-2016, Facebook would not allow a Facebook page to pay to boost content where the content had text on images and where the text appeared on more than 20% of the image. Today, Facebook still prefers images in boosted posts and other advertisements to use less text. 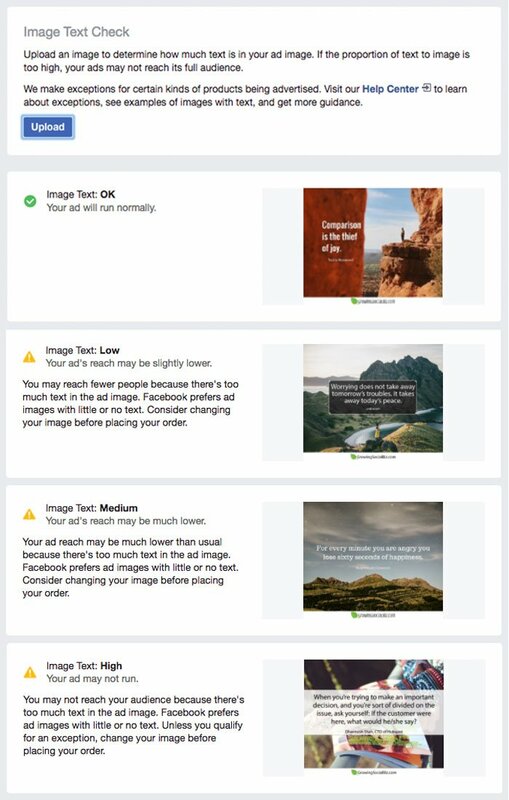 But rather than arbitrarily declining to boost or promote images with text on more than 20% of an image, Facebook now provides warnings about how extra text might impact the reach of your boosted post or advertisement. Now, the more text used in advertised content, including boosted posts, the less exposure Facebook may give the paid content in the news feed. To find out how Facebook will categorize a particular image, use their ‘Image Test Check’ Tool (aka the ‘Text Overlay Tool’). The image below gives a few examples of branded inspirational quote mages and how Facebook classified them using the Text Overlay Tool. To be clear, although Facebook prefers less text, images that are classified as Low or Medium still seem to do quite well, usually, as boosted posts. Images are an important part of sharing content (paid or organic) on Facebook. So too on other social networks. Without an image or images, content shared on Facebook, whether by Pages or individuals, is easily missed in the news feed. As mentioned, while Facebook still favours images that have less text, there is no longer the hard and fast “20% or less” rule. Overall, less is more when it comes to text. But sometimes you may need just that little bit more for the text to be relevant or serve its purpose. The key is to make the text on images easily digestible in the news feed at a glance. You can do this by having the text cover the whole image, but if you do the reach of a boosted post will be severely limited, if it has any reach at all. 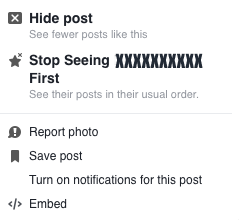 Image of popup box of options Facebook provides to users on posts. Facebook is trying hard to make sure the content fans see in their news feed is what they want to see. Often, this does not include promotional content from brands. If your business wants to reach potential fans/customers in a way that has them wanting to see more of your content, rather than less, you need to be wise about what you share on your Page and what appears in the news feed. When people don’t like what they see from you in their news feed, Facebook makes it easy for them to hide your content. Fans can also choose to ‘unlike’ your Page so they won’t see you in their News Feed. This is one of the stark differences between print advertising and social media advertising. With social media, if people don’t like what they see in their news feed they have easy ways to block it, and you, to show their displeasure. Not so with print media. Few Facebook Pages seem to take advantage of paying for Facebook reach. The price to advertise on Facebook is low compared to other advertising options and the potential reach and targeting options available to Pages. Unless of course, the audience you hope to reach is not on Facebook. If they’re not on Facebook it obviously doesn’t make sense to advertise there. But with in excess of 1.7 billion people worldwide on Facebook, chances are the majority of businesses could benefit from advertising on Facebook. When you pay to boost content on Facebook you open up a world of possibilities. it’s not just those who have liked your business Page that you can potentially reach. It’s all of those who are on Facebook but don’t know about your business or who know about you but just barely. If you have had a Facebook Page for any length of time you’ve likely watched in dismay as organic reach for your posts has steadily declined. For you, chances are in the early days (pre-2012) your focus was on building the number of people who liked your Page because, at that time, all of your fans saw what you posted. Not so anymore! As early as 2012, if not earlier, Facebook was making changes to limit the amount of Page content that made it into their fans’ news feed. Last June Facebook announced more changes to their News Feed. Few Pages do well on Facebook without paying anymore. The Pages that do well without paying have built an engaged and passionate audience who visit their Page on a regular basis to find out what’s new. This works for some businesses but not all. For most Pages though, if your fans don’t see your content in the Facebook news feed, they won’t see you on Facebook at all! If they don’t see you, unless they’re tightly connected with you, chances are they won’t think of you at all. They then have no reason to think of you or engage with you from time to time. When the day comes and they need or want what you have to offer will it be your business or a competitor’s who they turn to? Paying for Facebook is no longer the future! It hasn’t been for a few years. Now, to ensure your fans and/or those who are not yet fans have an opportunity to see your content in the Facebook news feed, you have to pay Facebook to promote your content. If you don’t, those who have liked your Page are unlikely to see much, if anything, of what you share. Examiner.com put it this way in 2014: “Facebook statistics show organic reach for your Business Page is dropping like a bowling ball off a high-rise.” And that was in 2014! In 2017, chances are if you aren’t investing time and money in Facebook, you’re wasting time and money on Facebook.